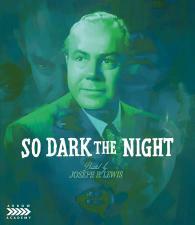 Like his contemporaries Howard Hawks and Billy Wilder, Joseph H. Lewis (Gun Crazy) dabbled in many genres, but excelled in the film noir tradition. A Hitchcockian tale of mystery and intrigue, So Dark the Night was one of his finest pictures. Inspector Cassin, a renowned Paris detective, departs to the country for a much-needed break. There he falls in love with the innkeeper's daughter, Nanette, who is already betrothed to a local farmer. On the evening of their engagement party, Nanette and the farmer both disappear. Cassin takes up the case immediately to discover what happened to them and who is responsible. As with his celebrated noir masterpieces My Name Is Julia Ross and The Big Combo, Lewis elevates the twisty, pulpy material with some of the finest noir touches the genre has to offer, beautifully shot by Oscar-winning cinematographer (Bonnie and Clyde).